Whether served with tortilla chips or atop a quesadilla, guacamole is the chunky, creamy avocado-based mixture we've come to love. Here are 20 places in the Valley where you can find the dip that makes all other dips green with envy. 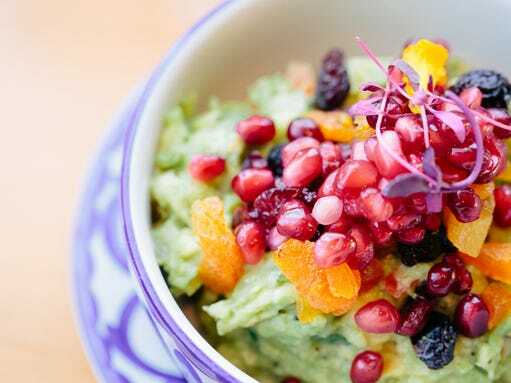 Watch your Guacamole del Barrio made with flair, prepared right at your table after dinner service commences, with creamy avocados, tomatoes, red onion, jalapenos, cilantro, lime juice and a dollop of pomegranate seeds for color and crunch ($11.50). 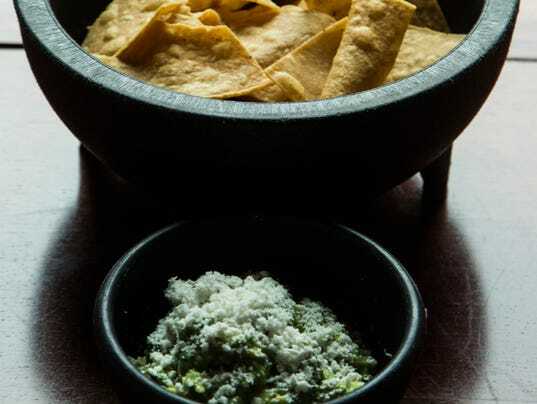 Share the guacamole or pig out all by yourself with this dip made from avocados, Serrano chiles, onions, tomatillos, orange and cotija cheese, served with tortilla chips ($4.50 for a single, $7 to share, add $1 to substitute raw veggies for chips). Details: 6035 N. Seventh St., Phoenix. 602-266-0831, otrocafe.com. Choose your flavor profile. Fresh guac is prepared with minced jalapeno, cilantro, fresh-squeezed lime, red onion and tomatoes, and then you add the rest by choosing house ($7.95) , grilled Serrano ($7.95) , caramelized pineapple-mint ($8.95) or jalapeño-bacon ($8.95) . Get four times the fun with the Cuatro, one bowl of chips served with three dips: salsa, bean dip and guacamole ($4.99 and $7.99). Details: 1615 E. Camelback Road, Phoenix. 602-264-4229, other locations at americastacoshop.com. You can make a meal of the guacamole and chips ($6) , a chunky mound of avocado mash sprinkled with white cheese and diced tomatoes — simply indulgent. Details: 5410 E. High St. (near 56th Street and Loop 101), Phoenix. 602-795-8111, modernmargarita.com. For a lighter fare, the tostada with guacamole ($3.25) is the way to go. An amazingly light and crispy tortilla is sprinkled with beans, cheese and lettuce, then topped with a smear of guac. Details: 7416 N. 51st Ave., Glendale. 623-939-3001. Smash up some avocados, add onion, jalapeno and green chiles, serve it with chips and you've got Ayala's satisfying appetizer ($6.50). Details: 8427 W. Peoria Ave., Peoria. 623-979-1121, search "AZ Kitchen" on Facebook. The chefs make it simply: avocados with sour cream, salt and garlic. Have it with the chips that come free for the table (small $4.25, large $6.75). Details: 10659 W. Grand Ave., Sun City. 623-931-3572, search "Nino's Mexican Restaurant" on Facebook. Have your guac on a big, fat burger. The Guacamole Burger comes with a half-pound beef patty covered in guacamole, melted Swiss cheese, red onions, lettuce, tomatoes and mayonnaise. It's served with choice of fries, sweet-potato fries, kettle chips or a cup of soup ($10.49). Details: 15226 W. Bell Road, Surprise. 623-251-4854, marleysrestaurantandbar.com. How about some nachos with your guacamole? 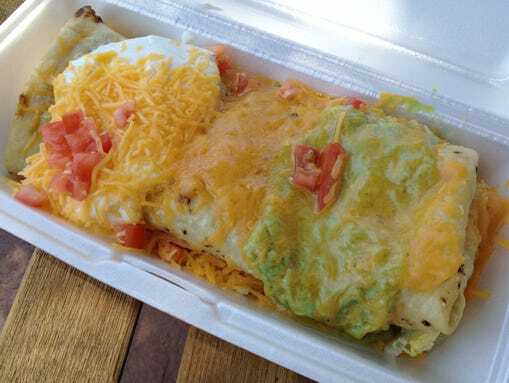 Old Pueblo's signature guacamole is the star of the Old Pueblo Nachos, a pile of chips with beans and cheese, lettuce, sour cream and choice of chicken, green-chile beef or red-chile beef ($9.95). Details: 102 N. Old Litchfield Road, Litchfield Park. 623-935-5059, oldpueblocafe.com. Have your guacamole with greens in the House Guacamole Salad, made with spring greens, tomatoes, cucumbers and croutons topped with a mound of guacamole drizzled with a vinaigrette ($4). Details: 3370 N. Hayden Road, Scottsdale. 480-994-1055, blindpigaz.com. 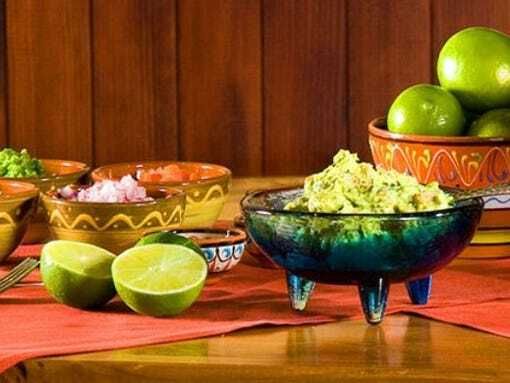 The guacamole is a chunky-creamy mix of white onion, tomato, jalapeno and cilantro piled high in a stone molcajete and topped with cotija cheese (small $6.95, large $10.95). Details: 2534 N. Scottsdale Road, Scottsdale, 480-994-1799. Also, 14795 N. Northsight Blvd., Scottsdale, 480-991-1799, lossombreros.com. It's all about fusion here and the guac is no exception. Go with the dried apricots and cranberries and pomegranate ($11) concoction, or explore the savory side with the bacon version, made with chicharrones and queso cojita ($11). Details: 6560 N. Scottsdale Road, Scottsdale. 480-397-9520, sumomaya.com. At Iron Chef Jose Garces' restaurant, the regular guacamole is prepared with avocado, roasted jalapenos and cojita cheese ($10), but you can make it extra special with the addition of real crabmeat ($5 extra). Choose one of four varieties: regular, made with avocados, onions, cilantro and Serrano peppers ($15) ; pomegranate, made with pomegranate seeds, mango, apples, pistachios and balsamic vinegar ($17); spicy crab, with blue lump crab, chile arbol and heirloom tomato ($18); and pepita, with roasted pumpkin seeds, queso fresco and salsa morito ($16). Can't decide? The combo gets you the pepita, crab and pomegranate varieties ($20) . Serves four to six people. Details: Fairmont Scottsdale Princess, 7575 E. Princess Drive. 480-585-4848, scottsdaleprincess.com. There's crunchy jicama in the guacamole here, along with tomatillos, roasted garlic, Serrano chiles, cilantro and onion. Served with chips ($8). Details: 302 N. Gilbert Road, Gilbert. 480-632-8226. Also, 5202 N. Central Ave., Phoenix. 602-274-8226. Prepared table-side and served with warm chips, this guac has tomatoes, red onions, cilantro, jalapenos, pepitas (pumpkin seeds) and cotija cheese ($10.75). Details: 7221 W. Ray Road, Chandler. 480-893-7550, other locations at ztejas.com. Served with chips, this guac is a mound of avocado, diced onion, tomatoes, cilantro, peppers, pumpkin seeds and lime juice ($8.75). Simple and classic, this rendition is a favorite of native Phoenician, longtime Tempean and former U.S Representative Harry Mitchell. Fresh avocado is tossed with tomatoes, onion and just enough cilantro for a citrus bite ($3.50, $5, $6.20). The taco salad is a fried tortilla shell filled with lettuce, tomatoes, onions, cilantro, cheese, chicken or shredded beef and a crown of guacamole or sour cream ($6.89). Details: 4949 E. Elliot Road, Phoenix. 480-893-3857, burritocompany.com. Arizona's craft breweries have compromised on a bill that will allow them to produce more beer than currently allowed in the state while maintaining their restaurants and bars. The Arizona Craft Brewers Guild is pushing for a change in state law this year that would clarify that the nearly 60 microbreweries could maintain restaurants and bars after exceeding a certain amount of production. Senate Bill 1030 was held up last month in a committee when the bill's opponents raised questions about its legality. The Guild then compromised on an amendment, which passed its first test Monday while advancing unanimously through the Senate committee where it had been held up. The bill's sponsor is Sen. Kelli Ward, R-Lake Havasu City. The new bill language will allow microbreweries to produce as much as 200,000 barrels of beer annually among multiple locations. The cap is 40,000 barrels today. A barrel is 31 gallons, or two full-size kegs. "This is exactly what we asked for," said Rob Fullmer, executive director of the Arizona Craft Brewers Guild. Breweries need to know there is a path for them to continue growing if they are to continue investing in Arizona, he said. Under the current law, brewers who make more than 40,000 barrels of beer a year are not allowed to run restaurants. That means the bigger breweries in the state, such as Four Peaks Brewing Co., can't keep expanding without selling or closing their restaurants, or changing the law. Supporters hope the amended SB 1030 moves through a full vote of the Senate this week. Under a three-tier system that dates back to the end of Prohibition, a company only can be a producer, distributor, or retailer of beer in the state, and can't do business as more than one of those. 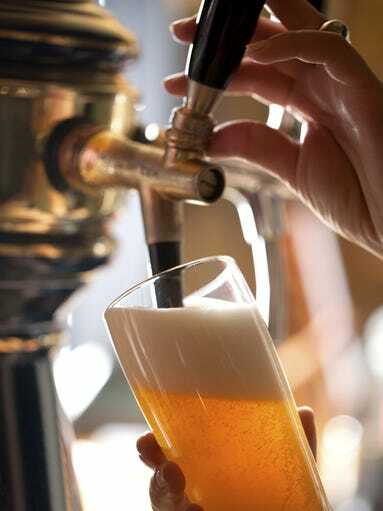 In 1987, Arizona passed special rules to allow small brewers to make and sell beer at their restaurants and bars. That allows them to act as a producer and retailer, with no distributor. Arizona brewers making less than 40,000 barrels of beer a year get special privileges, such as being allowed to "self-distribute" beer to a second location themselves without a distributor. Current law also allows them to self-distribute 3,000 barrels of beer a year to other retailers. Under the amended bill, a brewer would have to give up those self-distribution rights once it exceeds 40,000 barrels, except for its on-site retail sales. Brewers also could not expand to any new retail locations once exceeding 40,000 barrels. "We don't know of any opposition at all," Fullmer said of the amended bill. The three companies that originally opposed SB 1030 approve of the amendments, Fullmer said. Those companies were Alliance Beverage Distributing, Southern Wine and Spirits and Young's Market. 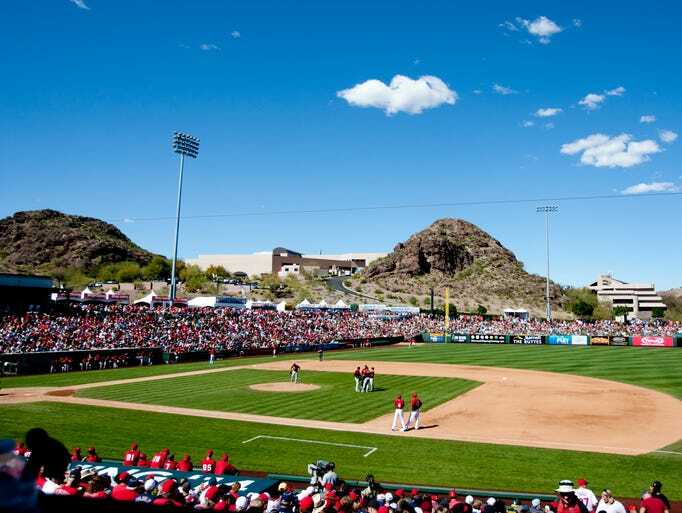 Collectively, the opponents refer to themselves as the Arizona Wine and Spirits Association. It’s always been my contention that three aspects are essential for a successful restaurant operation 1. Great food & beverage offerings 2. Ambiance & setting 3. Service What I have found in my business of Hospitality Evaluating is that many new operators have great ideas, concepts and food. They fuel that with optimism and gumption. However, many fail to recognize the all-important service aspect being an essential catalyst to either success or failure. The staff is the representative of the concept and if the delivery is faulty then the vision is marred. I have discovered a propensity for many chef driven concepts, because their focus on the artisan part of their concept, fail to adequately address honing the front of house staff and even though their product may be flawless if it’s delivery isn’t, then that’s what many will strike as its label can be negative. In my opinion, it’s extremely important to have the service aspect down from the launch as you only get a first impression once. And if flawed Yelp! service reviews begin popping up, the up-hill battle to establish a granite foundation and a positive quality brand just get that much steeper. · Bartender 1- Xxxxx; Caucasian female, slim build, blond hair worn back, wearing a light blue uniform button down top. · Bartender 2- Xxxxx; Caucasian female, medium build, blond and brown hair worn back, wearing a light blue uniform button down top. · Bartender 3- Xxxxx; Caucasian female, slim build, short blond and brown hair, wearing a light blue uniform button down top. She asked the Agent if they were ready to place their order and the Agent placed one with her. She did not make any suggestions or mention any menu items by name. The Agent asked her opinion about some of the menu items but she seemed to be quite picky saying that she had not tried many items since she did not like them. The Agent’s food was delivered by Theron and Xxxxx did not check back for quite some time. The Agent informed Theron of an issue with their food which he fixed promptly. Xxxxx did not even seem to notice or say anything about the issue. She seemed to be very overwhelmed and not to be smiling or very friendly. She did not give the Agent any silverware and they had to flag her down to ask for some. She appeared to forget and the Agent had to flag her down and ask again. She took a short while to come clear once the Agent was done and she did not offer refills for a very long time despite the Agent’s glass being empty. She did not offer dessert and came to offer the Agent the bill a very long time after they were done eating and drinking. Once the bill was served payment was processed quickly. The Agent would like to note that they were only charged for 2 of the 3 drinks they had ordered. Xxxxx was observed to be pouring a 5 count White Russian with a 3 count of vanilla vodka and a 2 count of Kahlua. On one occasion the Agent overheard a patron asking Xxxxx if their drink was a double. She said she had made the drink a double and put an extra shot in the extra blended drink portion. She told the patron that their drink in fact had 3 shots in it and he seemed happy. Xxxxx was observed to be texting on her phone behind the bar. Xxxxx was observed to be bringing glassware to the bar and holding the glasses with her fingers in the cup. She was observed to be doing dishes. On one occasion she was observed to be pouring a 3 count. Xxxxx was observed to be doing dishes. All of the bartenders were observed to be using an ice scoop. The Agent observed Xxxxx to be working alone behind the bar for the majority of their stay and they wonder if Xxxxx and Xxxxx were actually servers. A receipt was not observed to be placed in front of bar patrons after each round. The Agent did not observe any patrons being ID’d. The Agent observed multiple patrons to be ordering drinks and taking them away from the bar. The Agent did not observe any children consuming alcohol but it would have been very easy for a patron to buy a minor a drink and give it to them outside of the bar..
Bartender – “Xxxxxx” on receipt, female, late 20’s, slender, highlighted blond hair pulled back and up wearing a turquoise logo tank top and denim shorts. asking “do you know what you’re drinking”? The agent asked a few questions and placed a beverage order. She seemed personable and friendly; however, she did not introduce herself by name or ask the agents name to associate a tab within the POS. agent is not able to tell if all patron’s drinks were accounted for. The agents tab was itemized and correct. She checked back several minutes later and asked if the agent was hungry at all; although, she did not make any suggestions or recommendations and left the menu on the bar the entire visit. During the evaluation the bartender checked back often and when appropriate offered additional drinks. She seemed to be aware of drink levels for all patrons at the bar and was attentive and friendly with the regulars. As far as drink preparation goes, she was observed using an ice scoop to fill glasses with ice, glassware used was clean, beer glasses were rotated and kept cold, wine glasses were polished and spot free and empty glasses were cleared from the bar in a timely manner. The agent observed several mixed drinks prepared at the bar. All were at a minimum of a five count pour which is heavier than the allotted amount. The agent observed an 8 count Jack Daniels honey for the service well; however, the agent is not able to tell whether or not it was supposed to be a double. She filled the glass with a 7 count pour and topped it off with a clearer colored mixer from the soda gun and then poured another 1+ count on top. On another couple of occasions the agent was able to observe the bartender pour a mixed drink that did not have a pour spout. The drink was prepared in a tall glass filled with ice with the amount of liquor filling the glass about two thirds of the way full. It was obviously far more than the standard 4 count measure. The agent recommends that all bottles be fitted with a pour spout and that the bar staff adhere to the standard 4 count measure outlined by the company to ensure consistent drinks and maintain cost controls. Wine was poured in an eyeball fashion of measurement. The agent recommends using the carafe for measurement every time also for consistency and maintaining cost controls. The agent made a few other observations such as the bartender drinking beer, making change out of the tip jar, texting on her phone, drinking from an open glass, and eating soup. The MOD and the bartender were observed drinking draft beer from small rocks glasses behind the bar. While it appeared that this was a “sampling” it is certainly a violation of the Arizona liquor laws. 12. For a licensee, when engaged in waiting on or serving customers, to consume spirituous liquor or for a licensee or on-duty employee to be on or about the licensed premises while in an intoxicated or disorderly condition. BARTENDER THEFT: Bartender adds double tip to bill. Credit Card Fraud. Ohhhh lovely December. The season of thieving dishonest bartenders and restaurant servers comes to its peak. The amount of theft happening in the hospitality industry soars 400% late November and December. Friends, watch your credit card statements as bartenders and servers do this all the time when they feel pressured to make holiday money. Greedy jerks weren’t happy with a big 25% holiday tip and had to add another unauthorized 20% tip on top. Friggin’ thieves. “Agent paid the bill with a credit card, left the slip blank except for Agent’s signature, and placed a $10 bill down with the credit receipt. On 12/3, Agent confirmed that the total charged was $48.61. Obviously, someone behind the bar had added an $8 tip on to the bill without authorization.